"I had no idea the Museum was so big!" A mansion neighborhood, one of several historical districts. A group of women working hard at The Copper Hollow Garment Company. A jazz band practices in the Factory District. The Museum features large cases with interconnected neighborhoods. Our Welcome Video gives you a quick tour of the entire Museum, with all exhibits. Watch a one minute video visit to our Museum. 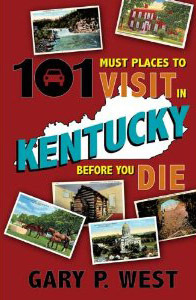 Kentucky Educational Television's documentary for Kentucky Life. 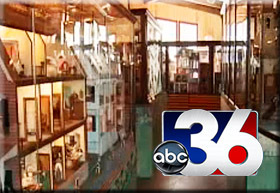 Lexington's Channel 36 video feature for ABC News. 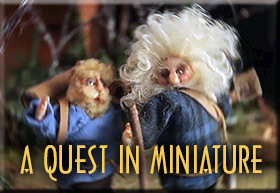 Watch our video about the two brothers quest for their long-lost third brother. 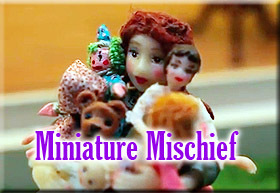 Watch our popular video about the goings-on with Gregory and the nanny, featuring the miniature scenario “Bad Kitty” by Alice Zinn. Number 1 on Trip Advisor! The Great American Dollhouse Museum showcases over 200 dollhouses, miniature buildings, and room boxes, furnished in remarkable detail and populated with tiny people at work and play. 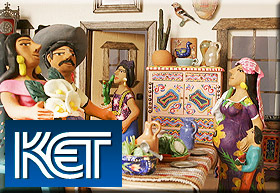 The Museum’s unique focus is the depiction of American social history in miniature. The Exhibition Hall presents as three major areas. The first, a timeline of United States History from Native American through Colonial, Old West, early Southwest and modern eras, gives the visitor a vivid sense of what it would be like to live in different regions of our country at various times in the past. The second major display area, a complete miniature town circa 1910, includes mansion, business, retail and factory districts as well as a Shaker village. Here, the visitor is lured into detailed fictional stories of the lives and characters of the town. The last section of the Museum contains a heavily forested fantasy land with faeries, elves, witches, trolls and a walk-in dragon cave. It’s just for fun and always well-loved by visitors of all ages. See us on FOX 56! 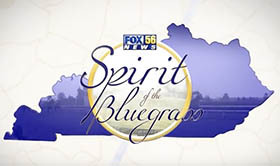 FOX 56 News visited us and you can watch their video visit here. A high honor bestowed by the Kentucky Tourism Cabinet, we've been designated an "Only One." Take a look. Acclaimed travel writer Gary P. West calls the Museum one of Kentucky's most important destinations, emphasizing "the wow factor." Check out his book. A visit from Bill Fortney and Ricky Skaggs! Photography expert Bill Fortney brought his Nikon Workshop to visit with us country and bluegrass star Ricky Skaggs. See pix and read more. Voted Best Cultural Attraction in the United States, 2012! Country Living magazine published a slideshow about dollhouses, featuring 10 of ours. Take a look !.